For those apostate/false "christians" who want to claim Cyrus as their savior (small "s"): while he did allow the jews to return to their homeland and build a temple (basically he signed a peace accord and recognized them as people of Israel. Yes, the same) what they dont talk about is historically: "It should therefore not surprise us that Cyrus offers sacrifice to the Babylonian gods Marduk and Nabu. This was his way of placating the gods of the lands that he conquered". He didnt release them because he was Jewish or even believed in The one God, he respected all religions, but personally worshiped Marduk, as he was the head god of Babylon, which he conquered and became King of. Babylon, was also surrounded by a huge wall. The only difference I can see between Trump and Cyrus is it seems Cyrus had respect, and showed it, for the people of the lands he ruled. From this Nation being modern day Babylon, giving Jews more Israel (although against what the international law and the original boundaries they agreed to) worshipping a different god, to the wall. Also, his name Cyrus, is actually Kuros. It means "Sun", which some attribute to the god of the sun, Apollo, which we find represented in ancient floor Mosaics found in ancient Synagogues. 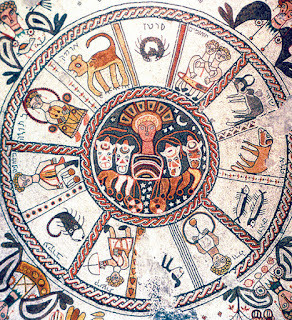 Mosaic Pavement, Beth Alpha Synagogue, Israel. The Jews coming out of Babylon, kept the deity worship , recognizing the head diety is always the sun god, though the name may be different depending on language and\or culture. Ba'al is Horus/Ra, is Zeus/Apollo, is Helios, etc. They realized it was the same god manifesting himself to every culture. 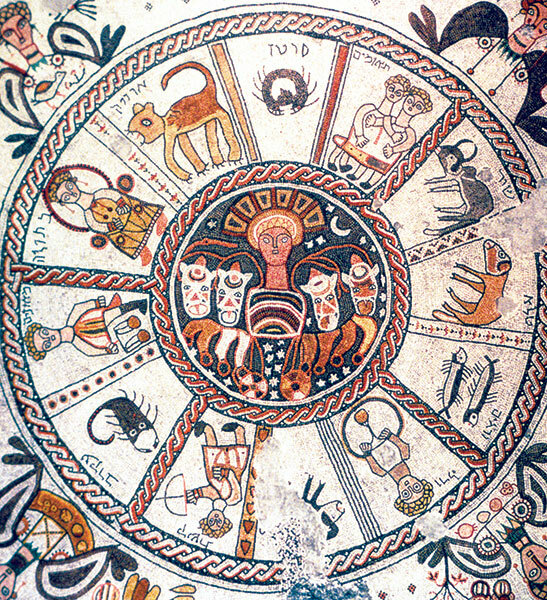 Here is a great short article from the Biblical Archaeology Society In which the author raises a simple question: what the neck is a Greek Sun God doing In Jewish Synagogues? therefore he shall be grieved, and return, and have indignation against the holy covenant: so shall he do; he shall even return, and have intelligence with them that forsake the holy covenant. 32 And such as do wickedly against the covenant shall he corrupt by flatteries: but the people that do know their God shall be strong, and do exploits. 33 And they that understand among the people shall instruct many: yet they shall fall by the sword, and by flame, by captivity, and by spoil, many days. Ok, this is may seem confusing, but there we can KNOW the SPIRITUAL truth of the matter: Israel was known as the Northern Kingdom and Judah, (of whose tribe we are) was known as the Southern Kingdom. Northern Kingdom are the Jews and fake and/or apostate Christians, while the Southern Kingdom represent the TRUE BELIEVERS who hold onto the truth of the BIBLICAL CHRIST and stand on HIS word, continually and PURPOSEFULLY walking in the Spirit and His ways. Lastly, the Masonic Encyclopedia has the Jews in captivity Babylon for 72 years, not the biblical 70. Remember: even when using the O.T, the Jews and Masons don't give it first place in their understanding. That would be their written oral tradition, the Mishna and the Kabbalah. When the Talmud, our Old Testament, contradict or is contrary to the Mishna, Mishna "explains" the "secrets of theTalmud" and not the other way around. The Mishna is HIGHLY subjective, based on the "understanding" of whichever "scholarly" Rabbi is exalted at the moment. Their 71 year celebration is May 8-9, 2019. Is it coincidental that their 72 year celebration takes place in the same year as our elections, (but SIX MONTHS and 5 days before the voting in the U.S actually takes place, which is scheduled to happen Nov.3)? I will leave the discerning believer to contemplate for themselves. In closing, Cyrus was not the person Jews and Christians are desperately trying to make him out to be to justify their sinful desires for more power. & Endure Until The End.